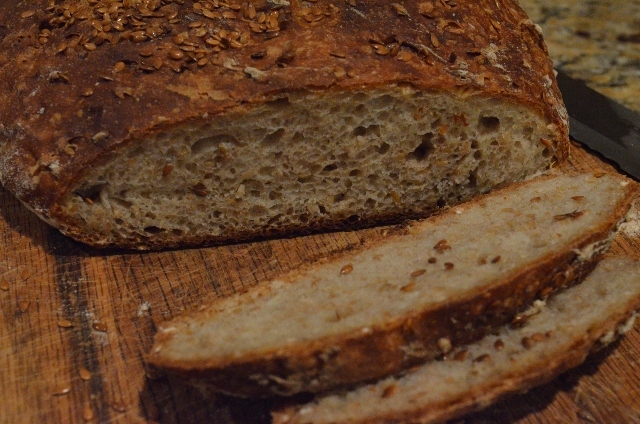 Here is another variation of a quicker version of no-knead bread. 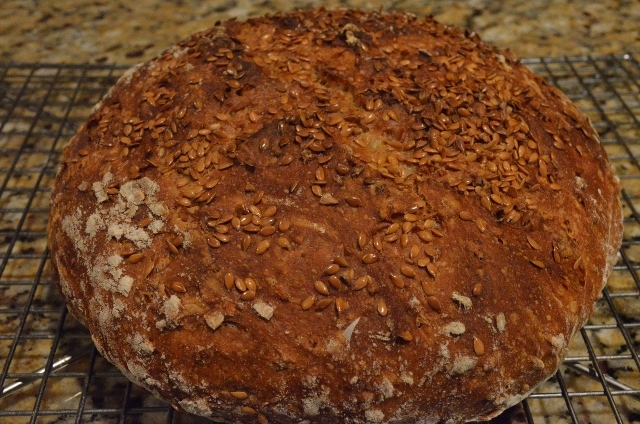 This bread uses whole wheat flour, oats and flax seeds to make a chewy bread with a wonderful crusty outside. 1. Add warm water to a large bowl. Stir in yeast and sugar and let sit for 4-5 minutes till mixture begins to bubble a bit and get foamy. Add remaining ingredients and stir with a wooden spoon. Stir vigorously until all flour is mixed and a shaggy dough forms. If the dough is too stiff, add a little more water. 3. After rising for an hour, pour dough on a large piece of parchment paper which has been sprinkled with flour. With well-floured hands form dough into a round ball. (The dough can be difficult to handle). Cover with plastic wrap and allow to rest for 15 – 30 minutes. 4. Remove cast iron pot from oven. Pick up ball of dough by the edges of the parchment paper and place in the hot pot. Sprinkle with more flax seeds if desired. Using scissors, quickly cut the extra parchment paper and place lid on pot.